I'm not sure how many people were really in danger of their save files being corrupted by last week's Quiet bug. After all, it would have meant taking someone other than D-Dog on a mission. As if. Those who did, for whatever reason, bring Quiet along on missions 29 or 42 risked having their progress erased. In a game based around logical outcomes to systemic actions, that's not a particularly logical outcome. Luckily it's now fixed—at least on PC and PS4—thanks to an update announced by Konami. 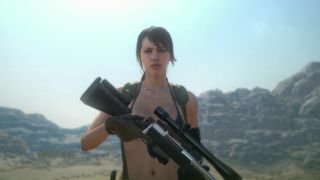 Other platforms still aren't safe from Quiet's wrath, but should be pretty soon. Personally, I was never in any danger of falling victim to the bug, having only reached mission 7 after 16 hours played. Others have done more, and got further. You can read their tales of humorous heroism here.